This brass torai or fog horn is an antique style brass horn. 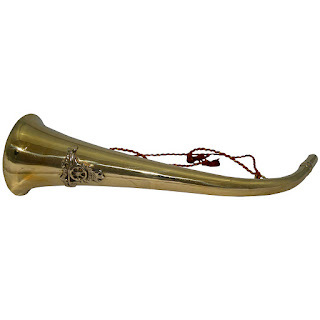 This hand held fog horn is a vintage reproduction constructed of polished brass. Antique brass fog horn comes complete with a cotton cord or string and is a very high quality instrument, just like antique fog horns. The mouthpiece reed is well polished brass and this foghorn is really loud. The hanging red colour cord on this turai is long enough to hang this fog horn as wall hanging decor object.